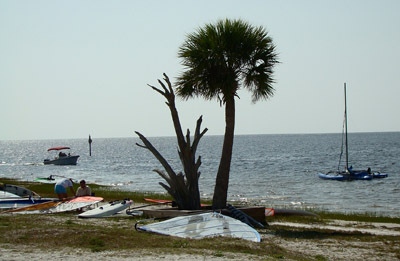 Shell Point Beach is the sailing spot of choice for members of the Shell Point Sailboard Club. Shell Point is about 45 minutes south of Tallahassee, Florida, and is located on the northern edge of Apalachee Bay (see map ). Although the beach was previously under private ownership, members of the SPSC and local activists of Wakulla County petitioned the State of Florida for grant money to purchase the beach, fearing loss of access due to condominium development. Grant monies were awarded to Wakulla County in December, 1995, and Shell Point Beach is now managed by the Wakulla County Parks and Recreation Department. Beach facilities are limited; however, the SPSC provides water, drying racks, and sailing camaraderie to its members and visiting sailors. During the winter months, winds are frontal related, with warm southwest winds preceding cold fronts, and colder northwest winds behind the fronts. These frontal passages often bring winds ranging from 25-30 knots. During the late spring and early summer, southwest sea breezes can develop in the afternoon, and wind speeds of 15-25 knots are possible. 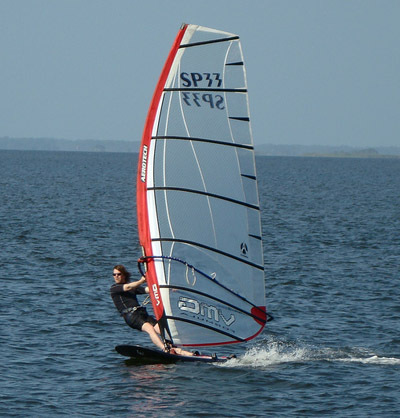 Current wind conditions at Shell Point are available by calling Windy the Windtalker at (850) 926-8802. 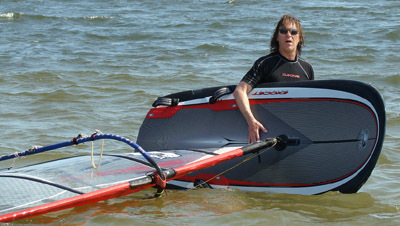 During the winter, surface water temperatures in the shallow bay are in the neighborhood of 50-60 fahrenheit, and depending on the air temperatures (35-75 fahrenheit), sailors wear either a drysuit or a wetsuit. During the spring and fall, shorties are worn, while in the summer, cutoffs and speedos are de riguer. A boat channel rings the beach, and offers access to the deeper waters of the bay. Sailors are encouraged to respect all boat traffic, and generally will cede right of way to avoid conflicts with other boaters. Outside the channel, shallow sand and grass flats are ankle to chest-deep, depending on the tide conditions, which fluctuate as much as four feet. Outside the flats, small waves (2-4 feet) can be enjoyed in 8-20 feet of water. Oyster bars are prevalent in the adjacent Oyster Bay area, and can be a hazard when sailing southeast or northwest winds. Although clearly visible at low tide, they can easily ruin a fin, a foot, or worse, and it is advisable to sail these winds cautiously until you learn the area.